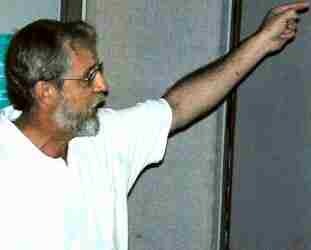 Collier Library, Houston Texas, 1:00 p.m., April 10, 2004, Tom Moore, President presiding. 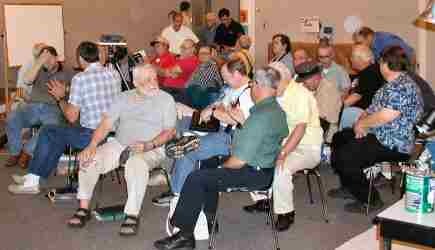 33 members were present, including visitors David Obert and Robert Mate. The club's new computer projector and screen were used for the presentation. No more renting visual aid equipment! Doug Chartier said that the foundry field trip did not materialize. However, he is working on a trip to a rubber molding facility. Jac Alcain and Russell S. Molina of Custom Rubber Products talked about molding rubber seals and other items for the oil and gas industry. 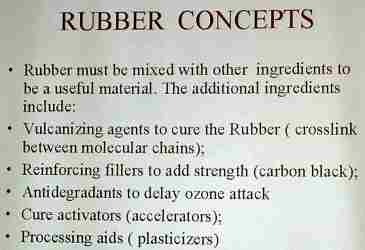 Rubber today is a synthetic engineered polymer that must be milled or kneaded (much like dough) and supplemented with various additives. In this raw form it can be stored in sheet form for considerable time prior to molding. The molding process forces the raw rubber into a mold. Finally it is heated to vulcanize or cure it. We had a hands-on workshop on hand sharpening twist drills. The experienced club members enjoyed showing the novice group how it was done; and the novices then tried their hand at sharpening. 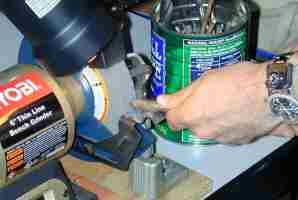 Rich Pichler had a two pound coffee can full of his beat up drill bits sharpened. Next time we will show a home video tape on how to make the swivel part of a C-clamp using a lathe. Time permitting, we will show another tape of Cooper Tools and another home tape. 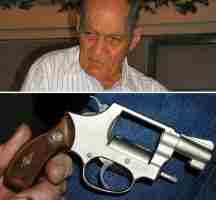 John Fusilier showed an old gun that he sand blasted and electro nickel plated. Ed Gladkowski showed the dial that he graduated for a down feed mechanism on a mill drill he is building. 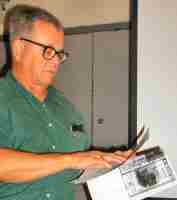 Rich Pichler showed a miniature tap and drill set that he picked up at a flea market. 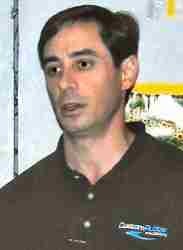 Joe Scott talked about "super quenching" (without producing steam) using a solution prepared from common chemicals. Joe Williams showed a collet holding technique used for deep hole drilling in copper. Steven Clay brought the 4-jaw chuck with carbonized jaws that he built. The photos show four special T- Slot mounted clamp units I made for use on my milling machine. The overall length was determined by the maximum length of material that would fit in to the table slots at the end. For my machine the length is 1.170 inch. The overall height of the aluminum base section is made to have the top of the part slightly below the surface of the mill's table top. The units are made to give about 0.015 inch clearance in both the vertical and side dimensions. The clamp screw is a 1" long, 5/16-24 SHCS with the head turned down to 0.399 OD using a brass fixture with a hole drilled and tapped 5/16"-24 and off center 0.050 inch. The screw is rotated with a hex key and provides the cam action required to make the unit hold a part. 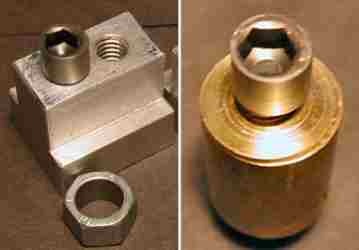 The hex section is a 9/16" nut with a hole bored to 0.400 inch. The clearance is not critical. The unit is clamped to the slot by a single 5/16"-18 set screw with the end ground smooth to prevent damage to the machine's slot bottom. 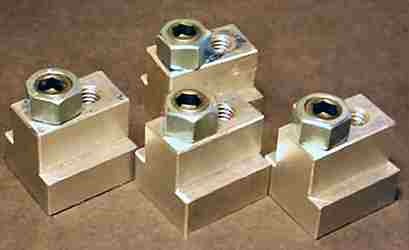 The units are very similar to the commercial product MiTee-Bite Fixture Clamps. The clamps were an exercise in using my small Logan Shaper and could have been made in a fraction of the time with the milling machine. The next meeting will be held on Saturday May 8, 2004 at the Collier Library 6200 Pinemont, Houston, TX at 1:00 p.m. Bring along a work in progress to show.